When I first bought this property a couple years ago, this entire backyard was a green lawn. My beloved dogs have managed to kill all the grass by digging holes everywhere. Can’t really blame them – there were gophers and my bloodhound has a nose that just wont quit. This is how the backyard currently looks. 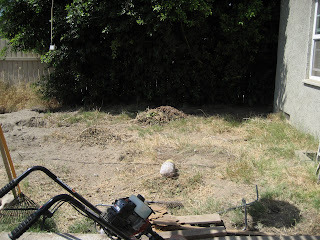 In the past couple of weeks, we cleared out some of the dead grass and weed. 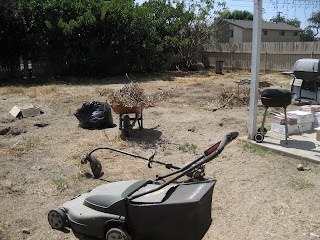 It actually looked a lot worse before, especially during the rainy season when three feet weeds covered the entire backyard. The scorching heat from this summer has helped killed most of it. 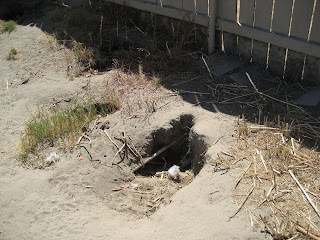 These are some of the holes that the dogs dug up in the past two years. Section 1 – This is the section to the right of the patio that we’ll be concentrating on first. I will post more pictures to show the progress of this area. This entry was posted in backyard long haul. 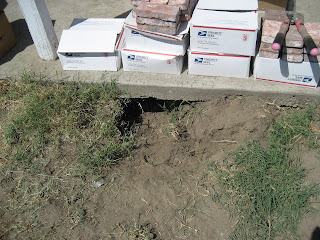 and tagged backyard holes, dead lawn, digging, dog dig, gophers tunnels. yea i wanted to do that but that’s a lot of pictures to post! you should do a 360 view of the entire back yard. panoramic!